When dissatisfied with a kitty portrait, I typically will wait for another shooting opportunity. Exceptions are often like today’s Featured Image: Unlikely future sighting—as must be presumed from the doorway locale. This is not an animal I expect to see prowling the street, despite the food dish down the alleyway, where a black cat ate but skittered away before I could capture the moment. That’s about as much outdoors to be expected. No offense intended towards the owner—and as caretaker of a fat ginger, none would be—this cat is the first chubby tortoiseshell that I have ever seen. Torties tend to be lean (and even mean). 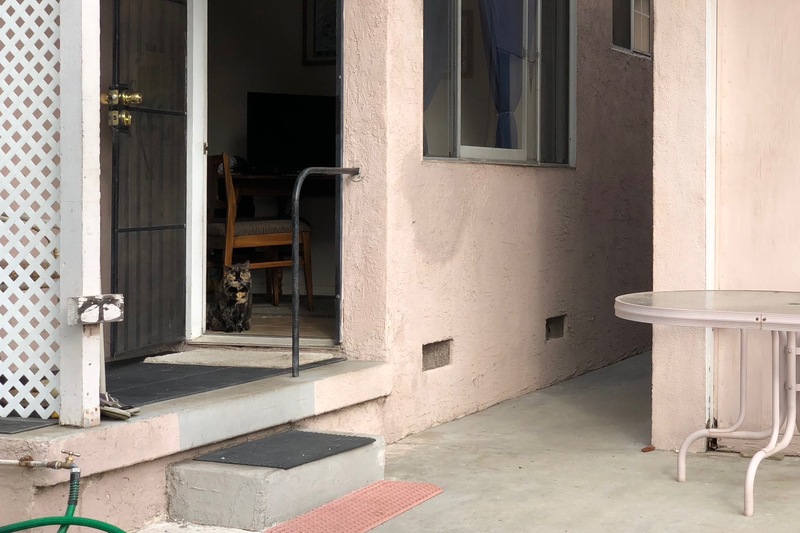 The furball watched me go by from a residence nearby Florida and Howard Avenue, which approach the outer edge of the neighborhood where it meets adjacent Hillcrest. I shot the portrait on Nov. 15, 2017 at 9:24 a.m. PST, using iPhone X. Vitals: f/2.4, ISO 16, 1/289 sec. 6mm. The final edit is a nearly 100-percent crop. Chunk (my given nickname) is the third tortoiseshell to appear in the series. The others: Dancer and Tortie. From the meow archives: Scruffy, Roly Poly, Woo, Skull, Biscuit, The Colonel, White, Chipper, Frisky, Stretch, Needy, Farfisa, Mates, Hunter, Pee-Pee, Blue, Blue Too, Bonded Pair, Patience, Fess, Jumper, Frenemy, Looker, Cozy, Scout, Lurks, Skit, Mini, Betty, Black and White, Stalker, Bell, Chill, Sammy, Scratch, Poser, Star, Grey and White, Watcher, Herman, Comet, Roman, Willow, Chub, Nimbus, Watson, Lilo, Kit, Pepe, Twilight, Sebastian, Spot, Booger, Ash, Veruca, Riley, Mellow, Bonde, Flower, Glass, Black, BeBe, Fang, Bruce, Siamese, Pounce, Tortie, Haiku, Fraidy, Peso, Daniel Tiger, Dusk, Stride, Dainty, Spry, Tabby, Betty Too, Still, Levi, Shadow, Sophie, Wink, Ferals, Momma, Charlie, Tux, Cool, Benny, Jellicle, Itchy Valentino, Goldie, Nine, Amanda, Siesta, ChaCho, Charlie, Too, Mika, Crystal, Seeker, Mittens, Dancer, Smokey, Monkey, Captain Blackbeard, Season, Maven, and Tink.